Seventy years on from the signing of the Universal Declaration of Human Rights, what is the state of human rights and their protection in today’s world? Do the words of the Declaration, penned in the aftermath of the Second World War, still ring true to young people across all continents? What sort of leadership is required to stem the tide of authoritarian populism, and is there any evidence that contemporary politicians possess the necessary will or convictions to meet global challenges? These were some of the questions that the Elders debated in a lively discussion at SOAS – University of London on 29 October, together with 50 young leaders from across the world brought together by the British Council’s “Future Leaders Connect” programme. The Future Leaders Connect programme creates a network of emerging policy leaders from 12 participating countries: Canada, Egypt, India, Indonesia, Kenya, Mexico, Morocco, Nigeria, Pakistan, Tunisia, UK and USA. Gro Harlem Brundtland opened the event with some reflections on challenges facing human rights leadership in today’s political climate: “We are celebrating the seventieth anniversary of the Universal Declaration of Human Rights, but many contemporary political leaders give the impression of being unmoved by this landmark text. Today’s biggest challenges are multiple: nationalism, migration, climate justice. We must encourage our current and future leaders to put human rights at the heart of the decisions they make on these issues. But she also posed a challenge to those who work on the frontlines of human rights activism, to ask themselves whether their policies sufficiently take into account the intersections between human rights, race, gender, sexual orientation and ethnicity – issues that had a far lower salience when Eleanor Roosevelt helped draft the Universal Declaration back in 1948. 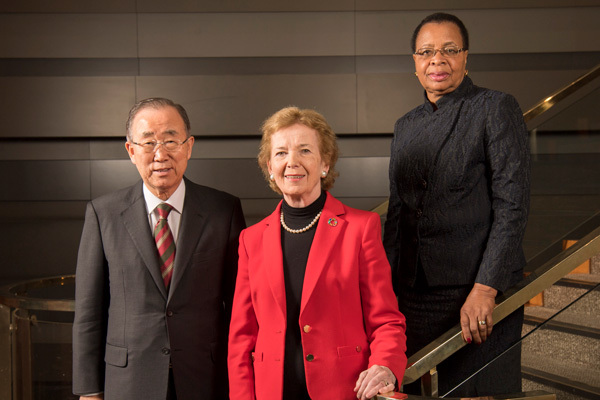 These issues were taken up in the first panel discussion between three former UN High Commissioners for Human Rights: Mary Robinson, Louise Arbour and Zeid Raad Al-Hussein, who left his post in August 2018. Together they bemoaned the worsening attitude towards human rights and those institutions charged with their protection over the collective course of their tenures. 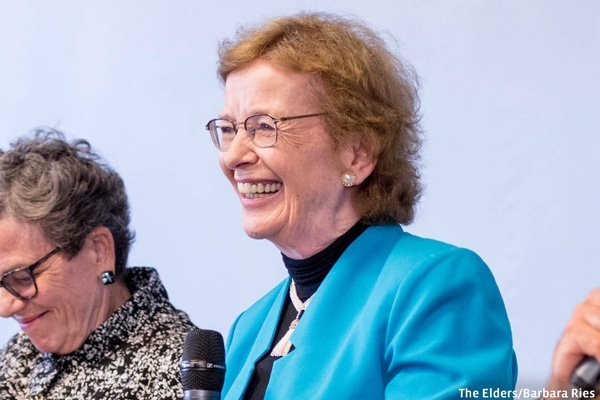 Mary Robinson noted that while she had travelled to China on numerous occasions and held substantial meetings, this had not been possible for her successors. Zeid said pithily that “it’s a brawl out there” for human rights defenders, blaming “medicore public leadership” and “charlatan” populists for the worsening climate and weakening public support for traditional human rights norms. When asked about increasing protections for those forcibly displaced by new threats, such as climate change, Louise Arbour stated that although she believed this should be the case, there was no chance of this process being launched now. “There is a climate now that is not conducive,” she explained, and those working in refugee protection would be concerned that reopening the refugee convention could mean losing ground rather than gaining it. 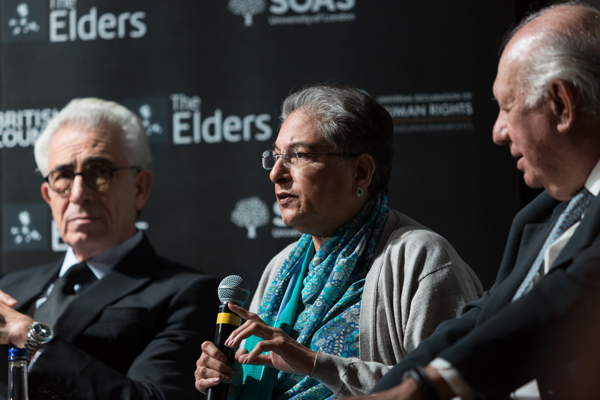 Their sombre reflections were followed by a second panel where three of the British Council’s Future Leaders presented their model of ethical leadership to Hina Jilani, Ricardo Lagos and Ernesto Zedillo from The Elders. Joe Devlin from Northern Ireland said, “Political power is fleeting, human rights are not. Our ethical leaders need to be tremendously courageous. They need to not be afraid to do what is right, not necessarily what is popular.” Rafia Saleem from Pakistan added, “Promoting and protecting human rights is everyone’s responsibility." In response, the Elders welcomed their engagement and commitment. Ernesto Zedillo encouraged them to engage with instruments and institutions of government to effect meaningful policy changes and not just rely on public protest. 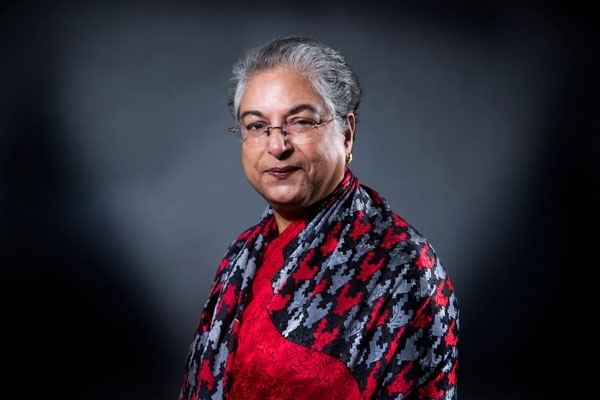 Hina Jilani concurred while stressing that young activists should “turn their fear into outrage” – a maxim she has lived by throughout her four decades of legal and social struggles in Pakistan. Ricardo Lagos spoke movingly of his experiences as President of Chile following the overthrow of the dictatorship of Augusto Pinochet, including victims of torture seek justice and resolution while protecting their rights to dignity and privacy.